This is a ‘getting started’ document based on my interpretation of best practices for beginning a new Django project. I’ve written this after going through the four part Django tutorial and reading the excellent Two Scoops of Django twice. 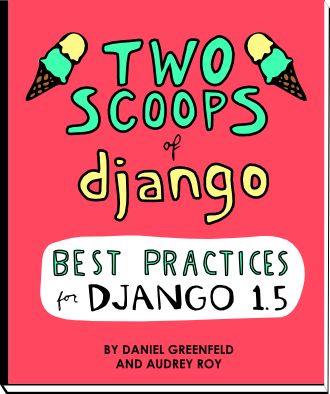 The aim for this document is to show you (and remind the future me1) how to jumpstart Django without having to go through the first couple chapters of Two Scoops each and every time. Pardon the lack of composition in this document. It’s a lab notebook. 2. 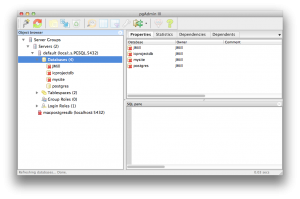 Create a new virtualenv, using the requirements file. Create a new virtualenv (Note for self: I called mine “django2s”)2, and use the local requirements file from Two Scoops’ project template. 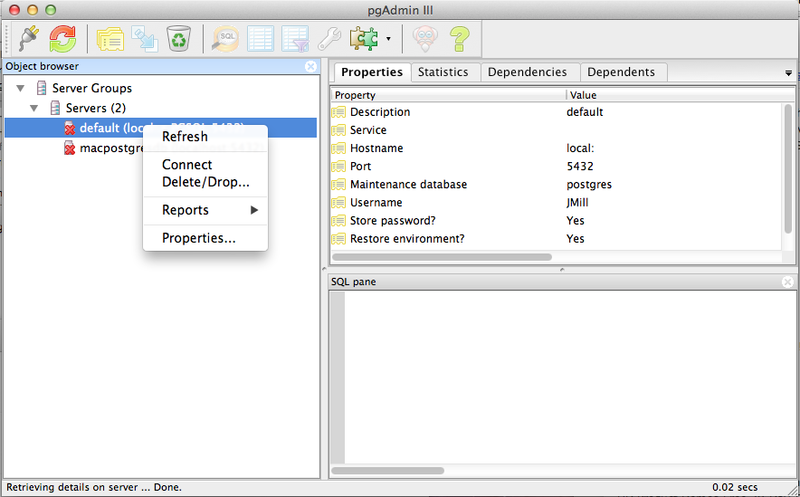 I’m using the GUI-based pgadmin application. 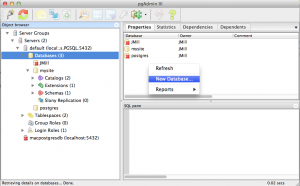 Connect to the database cluster by accessing the default postgres db. 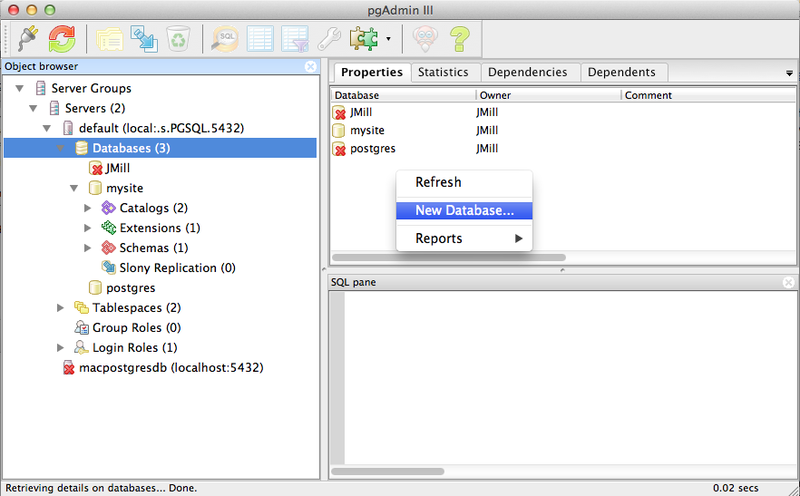 Create the new database. Right-click in GUI and create icprojectdb. Also, put your name and email in ADMINS=. 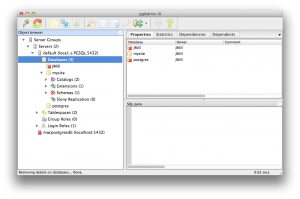 In Terminal, we need to create some tables in the database. This will enable our admin interface, for starters. and this is due to how django-admin.py does not add the present working directory to the python path. Activate your virtualenv, if it isn’t already activated. Warning: Converting "icratings" to "/the/full/path/to/icratings"
Using manage.py limits us a bit because it is not as easy to use our other settings files. Your manage.py file will use a hard-coded settings file. Regardless of which command you use, once you get the server started, direct your browser to the admin page on the server: http://127.0.0.1:8000/admin/. 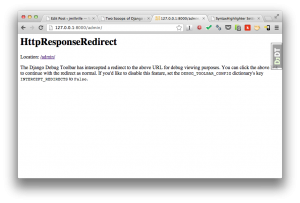 You’ll be presented with the login screen: You may be presented with an HttpResponseRedirect warning. Click the “/admin/” link to proceed. This is the point where I started a new branch in source control so I don’t screw everything up. (Note to self: branch is called “demo app”. If there are other things that need testing beyond forms, models, and views, then extra whatever.py files can be added into the tests/ directory. 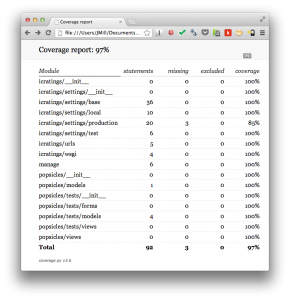 $ coverage html --include="$SITE_URL*" --omit="admin.py"
In the project root ($SITE_URL), enter the folder “htmlcov” and open index.html in a browser to see test coverage. 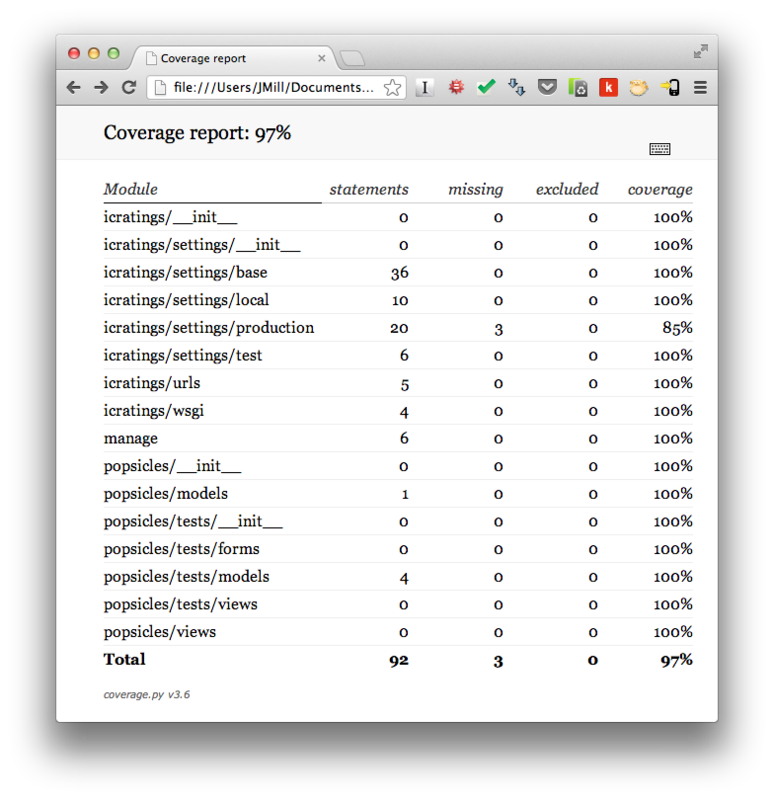 The tests surveyed the entire Django framework plus third party packages in the virtualenv, which is mostly unnecessary. 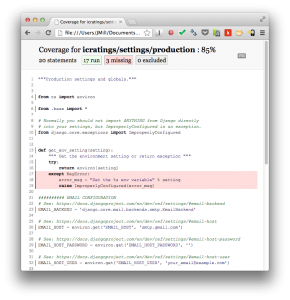 $ coverage html --include=`pwd`/* --omit="admin.py"
I’m not certain that we need to omit admin.py, but maybe so. [Note: Here is a reference for coverage.py] The test results are below. Notice that we have nearly full coverage of the code. 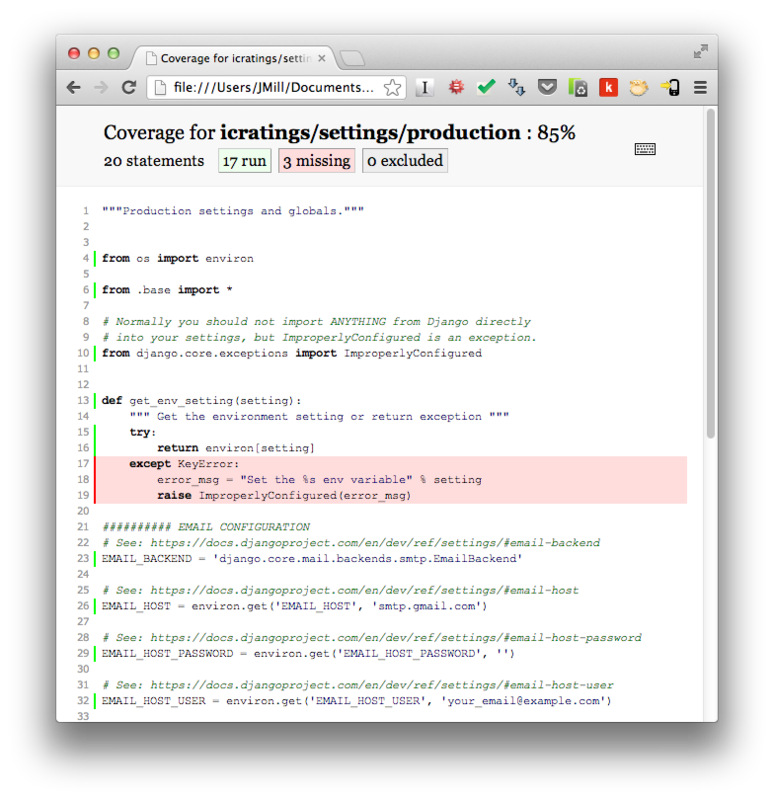 The part for which we do not (yet) have coverage is the icratings/settings/production.py file’s KeyError exception. At this point, that is alright. Whew. That got us really far. Lets take a break! Your next step is to flesh out the model of your new app (‘popsicles’, in my case). Remember to do syncdb when you get the model fields written. Good luck! 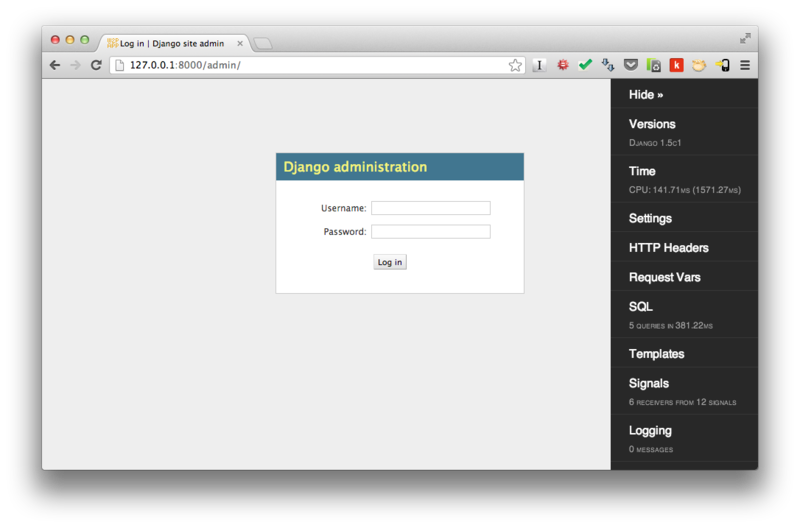 Update 2013-02-03: Read on to the next post, Onboarding a Django app within a Two Scoops-style project, in which we work to migrate the ‘polls’ app created during the Django 4-part tutorial. 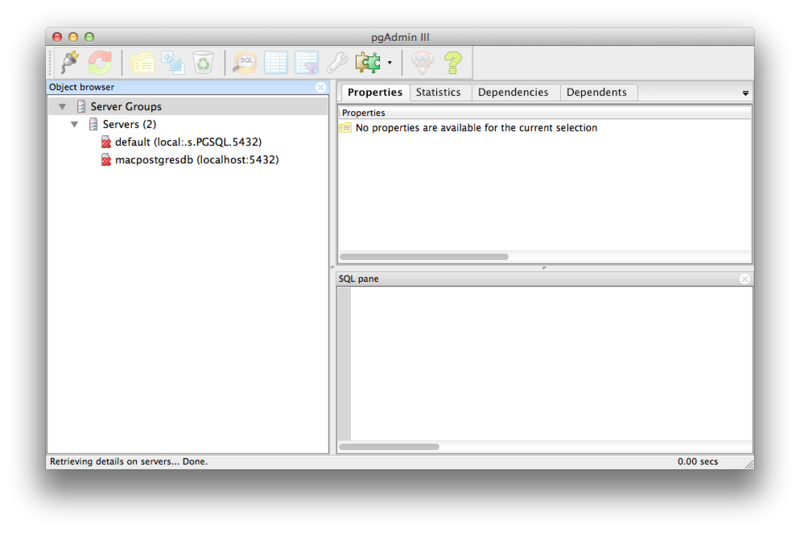 We are migrating an existing app because I’m not yet comfortable sharing how to write a model for the ‘popsicles’ app.